The beginning of my juice fast is making me feel sad. Beyond basic hunger, the soothing feeling of food is near gone. I have a small carb-centric meal in the morning then I juice 32 oz worth of fruits and vegetables to sustain me, along with my intake of 104 oz (13 glasses) of water, throughout the day. The first thing I’m disappointed to realize is that food is the only thing that soothes me. Most of the thoughts my mind visits over the next 16 hours of wakefulness are not comforts that replace the desire to eat—a desire that persists even without stomach pains. I watch pizza show after pizza show on youtube and imagine every bit of olive oil and milky mozzarella sliding down my tongue with fresh basil and savory sweet tomato sauce. The bread pushes back ever so gently as I sink my teeth into it and sink my lips into the juices on top of it. Before my fast started, I watched shows about people afraid to eat for whatever reason and their restraint astonished me—that they could appear to be normal people who in reality were torturing themselves towards an undefined, early date of demise—wasting away gradually and not perceptibly enough to make them stop until it is too late. Do they feel what I feel now? I feel uncertain that I’ll make it through the day and the only thing keeping me together is knowing that the next morning when I wake up, I won’t be hungry at all because I ate just enough food and drank just enough green juice and water to hold me over until I could lay perfectly still for 8 hours without needing any sustenance. Three days into the fast and I no longer feel sad. I feel a resurgence of passion for food that I do not recall the last time I’ve had. I look forward to eating because I know I’ll be hungry right before I eat it. My one true meal is what I think about all day long until I get to it in the morning. I plan for it. Initially, I planned a day ahead but then a couple of days in, I have every meal planned for the rest of the week. My meals are reaching professional culinary proportions—at least making guacamole seems so to me. Saturday, I’m going to make mushroom and cauliflower soup. I recently decided to add taro, but it’s poisonous so I task my husband with letting me know when to stop boiling it. Is insanity like this? Does an obsession take over all other reality? Or, am I just hungry? Maybe both. I’ve lost 6 pounds in 5 days and my favorite jeans are now my favorite jeans again. While cooking, I imagine it would make a good youtube video. I imagine that I could make a living off of people watching me fumble my way through learning how to prepare for myself exactly what is best for me to eat. I don’t want to weigh 180 anymore. I’ve never been more than 165 for more than three decades. Why do I have to give into what is assumedly inevitable for other people? I care. Taking a long time to stand up or fearing sitting down because it will take a lot to get up again is not my idea of the good life. I have fasted three times before. The first time, I was in the Peace Corps in Cote d’Ivoire and I wanted to sympathize with the Jula, Senoufo, Mossi, and other Muslim ethnicities there that forged through the Fast of Ramadan once a month, every year. One meal just before sunrise, another meal just after sunset, break your fast with water both times, and do not eat or drink any water throughout the day. I lasted two weeks until Thanksgiving and I thought I could restart the fast thereafter. It did not happen. I had already gotten the real benefit of my fasting experience by then—appreciation. The second time, I lasted for one month. The third time, I just kept going for half a year until one day my mind switched on and clearly told me, “You don’t need to do this anymore.” I felt so good for those 6 months. Everything that I ate had a purpose and I could feel it in my body. Nothing went to waste. The amount that I ate every day was just enough. I felt strong and I was going for runs daily even. But, now I’m feeling unsure this fourth time. I’ve gone a bit extreme—no second meal just after sunset. I don’t know if these rushing feelings to down something quickly are feelings I should push through or feelings that are warning me I’ve pushed myself too far. So, I break and eat twice today along with my green juice. And, I want to eat more. But, again, I just want to eat more. I’m not actually hungry now. My energy has increased. However, I miss that feeling of a good taste—something I know will automatically make me feel happy, in that moment, to be alive because in this moment I’m not sure I’m happy to be alive when all I am is hungry. And, still, I cannot tell the difference between what I want and what I need. I’m not sure if this fast this time is making me appreciate the basic things in life or it is just making me feel basic. Are needs better than wants and does that play out in the same way on macro and micro scales? Why am I juxtaposing the two? Perhaps, if I keep going, I will find out—meaning, doing everything I can to keep myself alive. Unfortunately, Catherine McKinley’s “Indigo” is another one of those books that could go grossly overlooked because it’s informative. 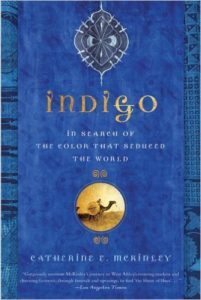 Truly her search for indigo revealed the severe tie between cloth and world history everywhere. A reader will get much more than the story of indigo in the world of textiles. In this narrative ethnography, full of desire and color, the reader will be introduced to the Nigerian medical doctor who discovers a cure for AIDS but then just a few pages later the reader gets folded back into cloth while learning that the Netherlands was the fourth-largest, slave-trading nation whose Dutch textiles made up 57 percent of the goods exchanged for human lives during their slave trade. Cloth constituted more than 50 percent of European exports to West Africa on a whole by the late 1600s—so that we see the incredible importance of cloth to West Africans that they would exchange lives for it. Concurrently, abolitionists over in America were staging boycotts of indigo and all of this information goes very well towards feeding the reader with the zeitgeist of the times. Cloth takes on its own persona in “Indigo.” McKinley makes cloth come alive as she explores its processes and its history in pre-colonial Africa as well. She effectively runs through the various types of cloth that were exchanged from East to West and North to South. Everyone around the world loved cloth in all its colors and textures. She also succinctly points out on a general note that the making of the ‘beauty’ during colonialism is also the making of the crisis that consumed many West African countries post-colonialism. Every bit of indigo McKinley can find not only furthers her Fulbright research but furthers her insatiable desire to ‘feel’ the history of the people when it is not readily communicable from its owners. She believes in understanding by osmosis so that when she lacks the information to steer her in the right direction for more culture, rather than assuming there is no more knowledge to be gotten, her self-determination, sheer faith, and belief in the power of cloth pushes her straight through to the places she needs to go and the people she needs to meet over and over again throughout her West African journey. The textile cultures McKinley discovers have been in West Africa for a very long time and as the needs of a global economy loom, she explains how that has necessitated that many West Africans start to place the pursuit of financial gain over the maintenance of laborious yet ancient and rare textile traditions. These cloth traditions do more than impart beauty but also translate generational heritage as indigo has been included in dowries passed down from mother to daughter and the symbolism embedded in the cloth itself expresses the various cultural values from ethnicity to ethnicity and country to country that she explores. If you are a nationalist, you may not notice the brown conspiracy happening across the Rio Summer Olympics. You might be too busy rooting for your own country to notice that the underrepresented are representing themselves quite well in Brazil. Black girls from around the world are stepping up in a big way and showing us that Black lives matter by keeping their own intact, prominent, and dominant. They are winning not just where they are expected to win but in many places few knew they even had interest. They are fencing. They are in water polo. They have captured judo. They are daring themselves into swimming. And, they are powerful in gymnastics. At just 23, Nzingha Prescod, born and raised in Brooklyn has stepped into an arena that is not usually available to children in urban areas. Simone Biles’s mother could not take care of her growing up because of drug addictions, but Simone has now become the first woman in the world to win three consecutive World Championship titles. And, let’s not even go into what many of the African athletes have been through to get here. World record breaker Ayana Almaz comes from the 2nd poorest country in the world—Ethiopia. The stereotypes have always been clear. Black people have short twitch muscles, not long ones. They can only sprint. They do not do distance well unless they are from some mysterious country called Kenya where no one can quite figure out why their runners are doing so well. Black people cannot swim. They are afraid of water. Now, we have Simone Manuel and Ashleigh Johnson to say the latter is wrong. This summer’s brown feats are not just wonderful because they smash the stereotypes, but because of what they represent about the societies Black people are living in. Becoming an Olympic champion takes money, time, energy, space, education, and an enormous amount of emotional support, many of these things not historically available to people of color in the U.S.A. If no one had stepped in and cared for that little Black girl with a drug-addicted mother, Simone Biles would not exist. 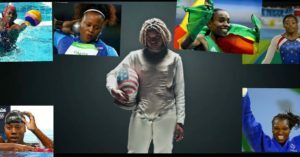 If the men training Nzingha Prescod had spent their time ogling her as a female object instead of giving her technique, mental agility, and strength, where would she be today? Not in Rio. Not alive possibly given the rate with which young, Black people are being targeted by the police. So, yes. By all means, be a nationalist if it means you are for equal protection under the laws for all citizens. But, also be a globalist and notice the shift. Your world is getting better. People of all backgrounds are showing up and showing the world that anything is possible and that talent can go as far as one’s commitment to greatness.